New Sport trim adds pop to the Legacy line. Subaru can no longer be considered a niche car manufacturer. Fresh off its eighth consecutive year of record growth, this burgeoning Japanese brand continues to attract a wider base of American car shoppers, thanks in large part to its SUV-skewed lineup. But that’s not the only reason Subaru is growing: the manufacturer continues with its near universal standard all-wheel drive fleet (the rear-wheel drive Subaru BRZ is the lone exception), an edge no other mainstream manufacturer can claim. Subaru’s non-SUV fleet includes the BRZ sport coupe, the Impreza and WRX compact models, and the Legacy — a midsize sedan. Notably, the Legacy is one of Subaru’s oldest and most enduring model names, introduced in 1989 and is now in its sixth generation. 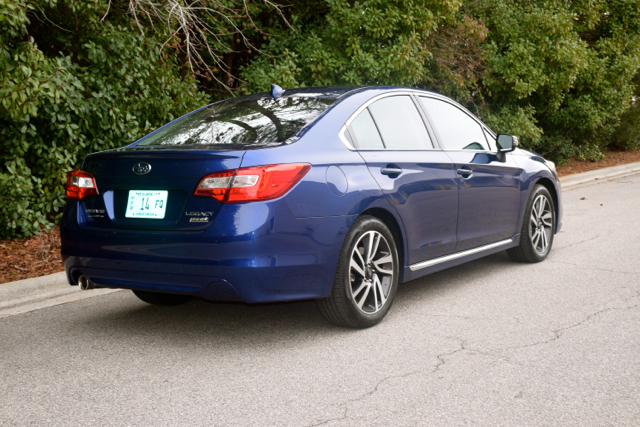 Originally a compact car, the Legacy was stretched to midsize status six years later and was also sold as a wagon for a season. Afterward, that wagon evolved into the Outback, one of the brand’s best-selling SUV models. The 2017 Legacy is available in five trims: 2.5i ($21,995), 2.5i Premium ($23,995), 2.5i Sport ($25,995), 2.5i Limited ($28,840), and 3.6R Limited ($31,640). A Legacy 2.5i Sport model was a recent weekly driver and was discounted by $2,000 before a $4,845 Sport Option package was added, bringing the final price to $28,910, including $820 for destination. The Sport trim is new for 2017. Other changes include new reverse automatic braking and high beam assist technologies. 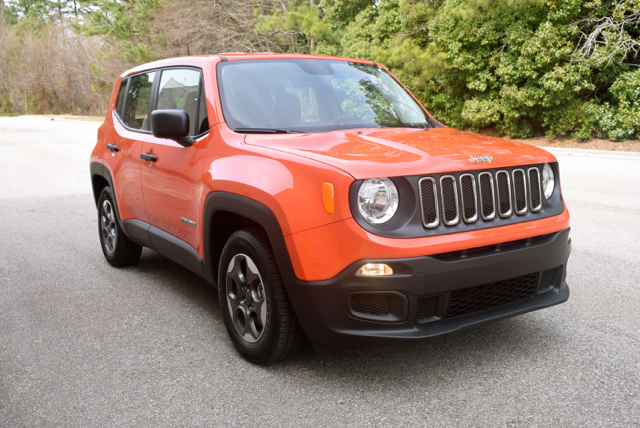 Speaking about the Sport trim, it features exclusive styling features such as a dark-gray front grille, fog lamps wrapped with gloss black housing, 18-inch sport-styled wheels, and chrome accent rocker panel trim. Inside, you’ll find a two-tone interior with piano black and carbon fiber patterned trim. Adding a Sport trim to the Legacy line was a wise choice for Subaru. The midsize segment continues under assault as consumers make the shift to SUVs. The Legacy gained ground in 2016, as sales increased by 8 percent just as net car sales fell by 8.1 percent according to Autodata Corporation. In any case, the Legacy is easily outsold by most manufacturers, with the Toyota Camry,Honda Accord, Nissan Altima, and Ford Fusion vying for leadership. Other models with stronger sales include the Hyundai Sonata, Chevrolet Malibu, and the Kia Optima. But in a segment where differentiation seems difficult to accomplish, the Legacy is the only model with all-wheel drive only. The Ford Fusion offers all-wheel drive as did the Chrysler 200 until the latter was discontinued in 2016. Even if the segment continues to contract, the Legacy should gain a larger slice of the pie, thanks to AWD and now a Sport edition. What the Legacy won’t win is a design award — neither ugly or handsome, the Legacy offers practical looks and contemporary style. Standard 17-inch steel wheels in the 2.5i give way to 17- or 18-inch aluminum alloy wheels elsewhere; all-season tires are standard across the model line. Projector-beam halogen headlights are standard; HID projector headlights are available. Fog lights appear at the Sport level. You’ll also find folding side mirrors with available integrated turn signal indicators, chrome embellishments, and one or two exhaust tips. Today’s midsize sedans offer true five-person space and the 2017 Legacy is no exception. 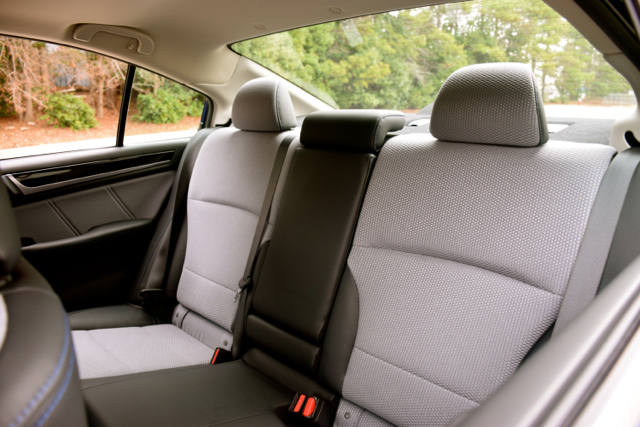 Sitting on a 108.3-inch wheelbase, the Legacy offers excellent room up front and suitable space in the rear seat. A 60-40 split-folding bench seat offers access to the trunk, measuring 15 cubic feet. All models, except for both Limited editions, are dressed in cloth upholstery. Leather-trimmed upholstery is standard on both Limited models. 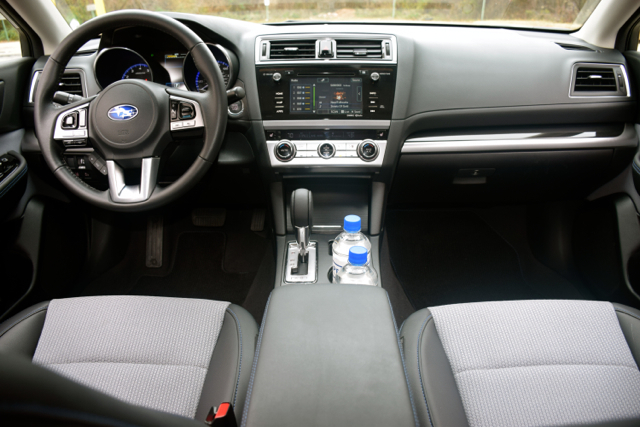 Moving away from the base models brings in such amenities as a 10-way power adjustable driver’s seat, heated front seats, and a leather-wrapped steering wheel. 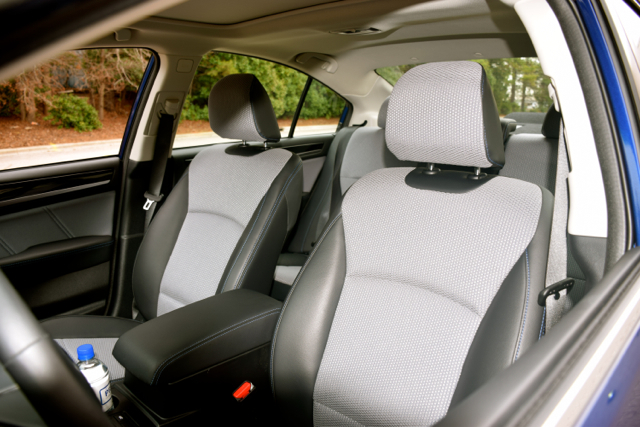 Also available is heated outboard rear seats and wood grain or carbon fiber-patterned trim. Keyless entry with push button start is available, as is an automatic dimming rear mirror, and dual-zone climate control. 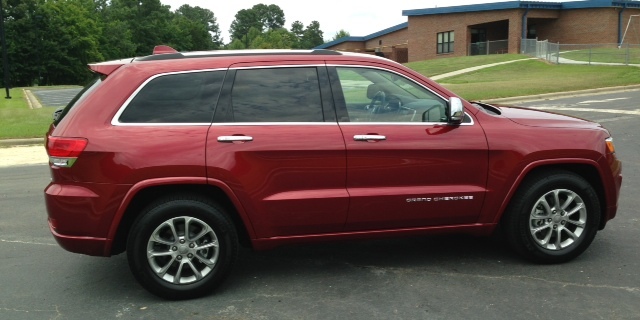 Standard equipment includes air conditioning, power windows and door locks, an electronic parking brake, and cruise control. Every model comes with a center console, an overhead console, a tilt and telescopic steering column, and eight cup and drink holders. On the tech front, the 2017 Legacy offers a standard four-speaker audio system. A six-speaker audio system is found with the Premium and Sport trims. Limited models have a Harman Kardon audio package — a 12-speaker arrangement with 576 watts of modulated deliciousness at the ready. If you want navigation, it is obtainable at any level, except with the base trim. The system is tied in with the STARLINK multimedia plus system with a seven-inch screen, Siri Eyes Free, HD Radio, a CD player, satellite radio, and Bluetooth. Only by opting for the upgraded STARLINK package is navigation available. Subaru has long held a merited reputation for stellar safety, including exemplary crash testing scores, and the 2017 Legacy embodies that. Once again, the Insurance Institute for Highway Safety (IIHS) has awarded this midsize sedan with its highest honor — Top Safety Pick+. 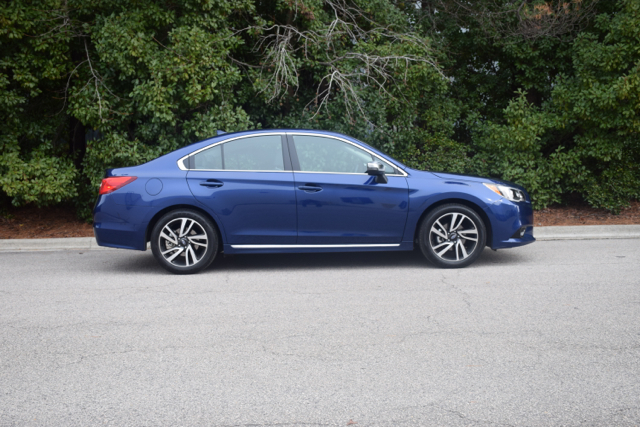 Beyond its symmetrical all-wheel drive system, the Legacy is equipped with daytime running lights, traction and stability control, and a rearview camera. Apart from the Legacy’s suite of airbags, it is the available package of driver assist features that clinch it for the sedan — namely high beam assist, blind spot detection and rear cross traffic alert, and EyeSight Driver Assist technology. EyeSight includes adaptive cruise control, pre-collision braking, lane departure and sway warning, and lane keep assist. You’ll find these options available on every trim except for the base model. 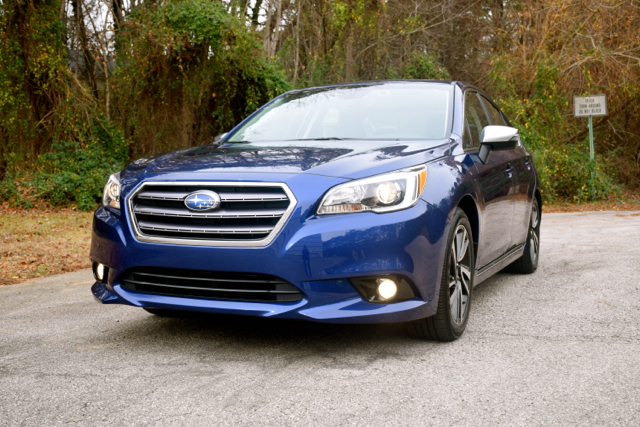 Subaru gives Legacy shoppers two engine choices. Both offer a horizontally opposed (Boxer) layout and that means the engines sit slightly lower in the bay. Both are paired with a continuously variable automatic transmission. The standard four-cylinder displaces at 2.5 liters and makes 175 horsepower and 174 pound-feet of torque. As equipped, these models make 25 mpg in the city and 34 mpg on the highway. The 3.6-liter six-cylinder engine is available only with the top-trim Limited model. 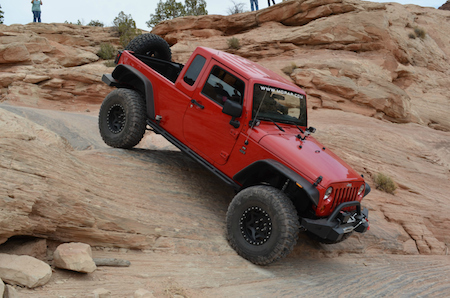 This version makes a robust 256 horsepower and 247 pound-feet of torque. 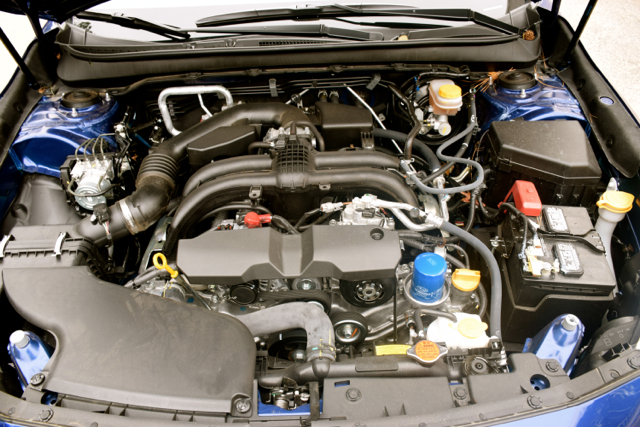 The 3.6R Limited achieves an EPA-estimated 20 mpg in the city and 28 mpg on the highway. The base model should be sufficient for most buyers. it delivers adequate off-the-mark acceleration and power increases steadily as it approaches highway speed. In the all-important “passing on the highway” analysis, the Legacy gets the job done, supplying sufficient faculty to pass and without lagging. Most people will probably be satisfied with this sedan’s steering — light to the touch — and handling — sufficient to superior, especially when torque is sent to the wheels that need it most. And the all-wheel drive system certainly came in handy when our area was socked by a winter storm. Our storms are typically icy, so that means I don’t drive at all as the all-wheel drive does no better than other options when it comes to stopping. It was only after the ice melted did I conduct the bulk of my driving, traversing slush and other melting material, while doing so in complete confidence. The Legacy stayed planted even as I pushed the sedan through my share of the many puddles encountered. You should consider AWD as an extra measure of security whenever you drive on wet roads. So, which model should you choose? I vote for the Sport as it has the looks and price point I think most people prefer. 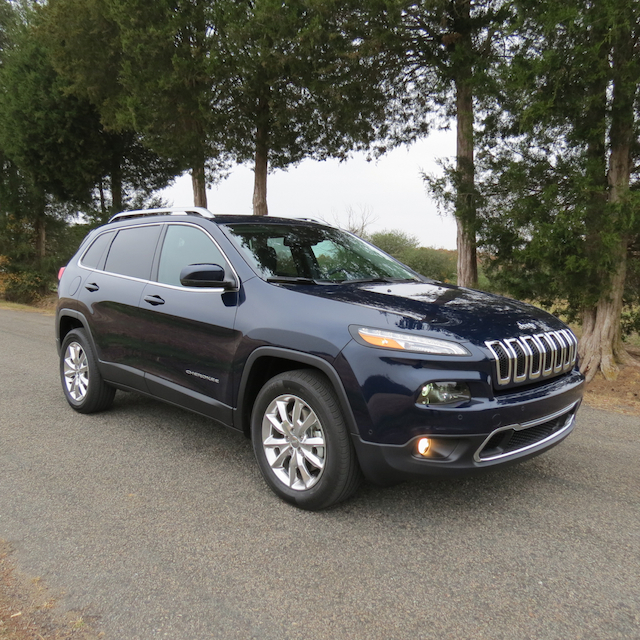 The package upgrade brought in a moonroof and the EyeSight driver assist package, among other amenities. For under $30,000 you get all-wheel drive and certain advanced driver-assist safety features, a combination no other model offers, except for the Ford offers. For a vehicle offering few surprises, there was one standout feature: fuel economy. 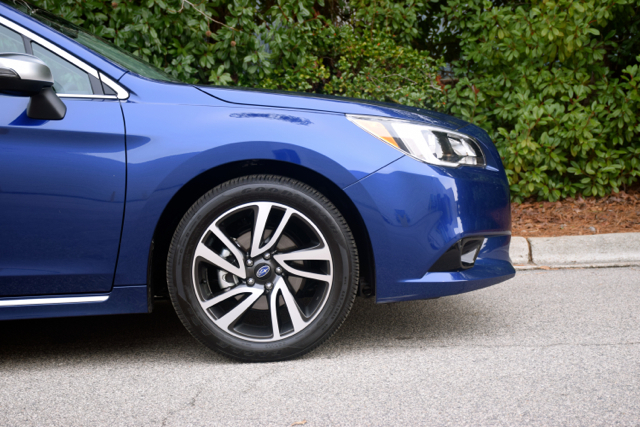 Indeed, after 246 miles of driving, the gas tank needle barely touched the middle position, demonstrating that even with all-wheel drive the 2017 Subaru Legacy is an altogether efficient machine.